Billion-year-old salt crystals, physicists suggest, could contain conclusive evidence of the existence of dark matter. Allison Achauer/Getty Images. Tiny pieces of billion-year-old salt could reveal the existence of dark matter, researchers claim. Dark matter is thought to comprise as much as 85% of the universe, but to date billions of dollars spent on high-tech facilities designed to verify its existence have failed to produce unambiguous results. Now, a team of physicists headed by Andrzej Drukier from Stockholm University in Sweden suggest a radically different approach. Dark matter is thought to be made of subatomic entities known as Weakly Interacting Massive Particles, or, delightfully, WIMPs. Current experiments designed to detect them rely on installing huge “target masses”, comprising, for example, 100 tonnes of noble gas, in remote and shielded environments, such as a cave or mine shaft. The targets are then monitored using detectors sensitive enough to pick up the recoil of a nucleus when a WIMP smacks into it. The targets are large in order to maximise the chances of a nucleus-WIMP collision – an event that particle physicists agree happens only very rarely because dark matter and visible, or baryonic, matter don’t often interact. They also have to be shielded because many other subatomic phenomena, such as radioactive decay and the impact of cosmic rays, are so much more common by comparison that dark matter is drowned out by the noise. Drukier and colleagues advocate a very, very different approach. In a paper published in the journal Physical Review D, they suggest looking closely at 100-milligram mineral crystals in order to find scars from past collisions. “We propose to examine ancient minerals for traces of WIMP-nucleus interactions recorded over timescales as large as [one billion years],” they write. The logic is compelling. A 100-tonne mass of noble gas monitored for 10 years might record a given number of dark matter collisions. A mineral speck buried in appropriate circumstances for a billion years may well have recorded more. To ensure that dark matter interactions aren’t overwritten by natural radioactive decay or even particles from space, Drukier and colleagues propose using salt crystals that formed deep underwater, called marine evaporites. “Such minerals have significantly lower concentrations of radioactive contaminants … than typical minerals found in the Earth’s crust,” they say. Dark matter is therefore the only source of these interactions, the physicists say, that can leave scars – nanometre-scale marks – on the crystals that can be detected by state-of-the-art technology. “Recoiling nuclei leave damage tracks in certain classes of minerals, so-called solid state track detectors,” they write. They propose two methods to identify these scars, depending on the size of dark matter particles – a matter which itself is a matter of considerable debate [Journal of Cosmology and Astroparticle Physics]. Drukier and colleagues say that the damage left by dark matter particles with a mass equivalent to 10 protons or less could be detected using a technique called helium-ion beam microscopy. The scars inflicted by larger dark matter candidate particles, with a mass greater than 10 protons, could be detected by using another approach, known as Small-Angle X-ray scattering. The idea that ancient minerals could be a path to verifiable dark matter detection is not new. It was first proposed [Physical Review Letters] by another group of physicists in 1995, using a mineral known as muscovite mica. That experiment, however, was limited by the measuring technologies then available – a matter readily admitted by the researchers. “We argue that a background may not appear until we have pushed our current limits down by several orders of magnitude,” they concluded. More than 20 years later, things have changed. Drukier’s team call their proposed set-ups “paleo-detectors”. They concede that, as yet, the idea remains largely theoretical, but propose a next step using minerals obtained from close to the surface and subjecting them to approximated WIMP interactions to demonstrate the feasibility of the approach. Indeed, they add that their experiments may in time reveal far more about the universe than just the verification of dark matter. “The sensitivity and exposure time also makes paleo-detector interesting for a host of applications beyond WIMP dark matter searches,” they write. We normally consider liquid water as disordered with the molecules rearranging on a short time scale around some average structure. Now, however, scientists at Stockholm University have discovered two phases of the liquid with large differences in structure and density. The results are based on experimental studies using X-rays, which are now published in Proceedings of the National Academy of Science (US). Most of us know that water is essential for our existence on planet Earth. It is less well-known that water has many strange or anomalous properties and behaves very differently from all other liquids. Some examples are the melting point, the density, the heat capacity, and all-in-all there are more than 70 properties of water that differ from most liquids. These anomalous properties of water are a prerequisite for life as we know it. “The new remarkable property is that we find that water can exist as two different liquids at low temperatures where ice crystallization is slow”, says Anders Nilsson, professor in Chemical Physics at Stockholm University. 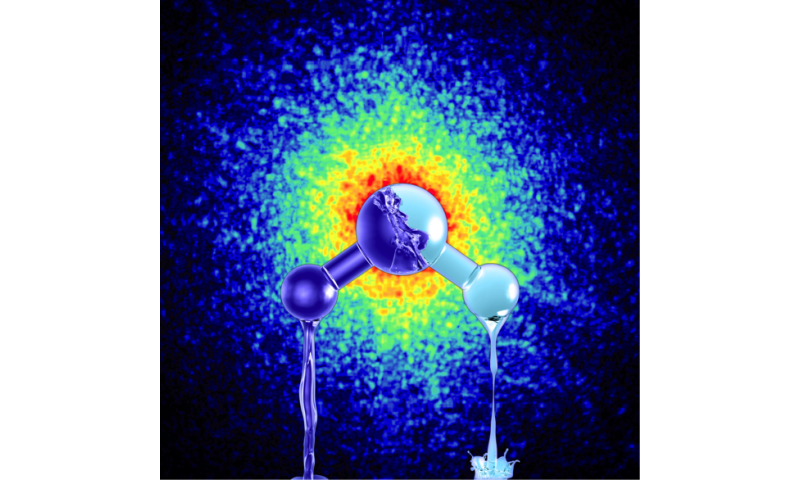 The breakthrough in the understanding of water has been possible through a combination of studies using X-rays at Argonne National Laboratory near Chicago, where the two different structures were evidenced and at the large X-ray laboratory DESY in Hamburg where the dynamics could be investigated and demonstrated that the two phases indeed both were liquid phases. Water can thus exist as two different liquids. “It is very exciting to be able to use X-rays to determine the relative positions between the molecules at different times”, says Fivos Perakis, postdoc at Stockholm University with a background in ultrafast optical spectroscopy. “We have in particular been able to follow the transformation of the sample at low temperatures between the two phases and demonstrated that there is diffusion as is typical for liquids”. When we think of ice it is most often as an ordered, crystalline phase that you get out of the ice box, but the most common form of ice in our planetary system is amorphous, that is disordered, and there are two forms of amorphous ice with low and high density. The two forms can interconvert and there have been speculations that they can be related to low- and high-density forms of liquid water. To experimentally investigate this hypothesis has been a great challenge that the Stockholm group has now overcome.